Ever since I can remember, growing up in the small city where I live, my family has used the same pharmacy. It’s a small, independent, “mom & pop” pharmacy located in a mostly residential neighborhood, rather than in the downtown business district, or the fast food / strip mall area just outside the city limits. I clearly remember being an eight year old kid, going to Condo Pharmacy with my Mom and Dad, and climbing up the 2 or 3 steps to get into this rather cramp, jam-packed little business that occupied basically a converted house. I don’t remember the inaccessibility being perceived as a problem, but I do remember that going up those steps was a rather difficult thing that we might remark on … not as an injustice really, but more of a little challenge for a somewhat physically disabled kid like myself. Looking back, I’m sure Condo’s had lots of regular customers who found the steps a hassle. I mean, in addition to prescriptions and over-the-counter meds, they did a medium amount of business in home medical supplies … grab bars, raised toilet seats, walkers and the like. For a business like that to be inaccessible didn't make much sense, even in the 1970s and '80s. At some point in the 1990s ... definitely after the ADA passed in 1990 ... Condo’s moved. Actually they built a new building right next door. The new place was bigger, roomier, with a small parking lot adjacent, no steps to get in, and automatic doors. It's still there, and most people around here still think of the place as Condo’s “new place.” The photo above is the "new place." Condo's is still my pharmacy. Part of the reason is that it’s easier to get to now than even the chain pharmacies outside the city … like Wall-Mart, Rite Aide, and Kinneys. They are also fully accessible, but are a bit of a hassle and a bother anyway because of relative distance, traffic, and overall busyness. I’m only writing about this because in a way, this is how accessibility is supposed to work for small businesses. It’s how we argue that it’s worth it for them to improve accessibility. I don’t know how much of Condo’s motivation for moving and building was accessibility, but I suspect it played a role. And I don’t know how the business is doing compared to the big chain pharmacies, but all evidence suggests they’re doing fine. I mean, they’re still here, and for small, local businesses that’s an accomplishment all by itself. I think their improved accessibility must have played some role in their continued survival, if not success. There’s maybe a lesson there somewhere. First of all, the topic of accessibility in the disability context is all about whether or not physical environments and objects … and nowadays, virtual environments like the Internet … are fully, equally, and independently usable by people with physical or mental disabilities. “Accessibility refers to the design of products, devices, services, or environments for people with disabilities. The concept of accessible design ensures both "direct access" (i.e. unassisted) and "indirect access" meaning compatibility with a person's assistive technology (for example, computer screen readers).” — Wikipedia “Accessibility"
That will do, I guess, but what intrigues me is that people interpret accessibility in fundamentally different ways. Some people view accessibility as a kind of premium feature that adds value and prestige to a home, business, or public facility. They advertise accessibility as a bonus to customers, or as a marker of “corporate responsibility,” worthy of public praise. Actually, it's surprising how few people who can actually do capitalize on good accessibility. 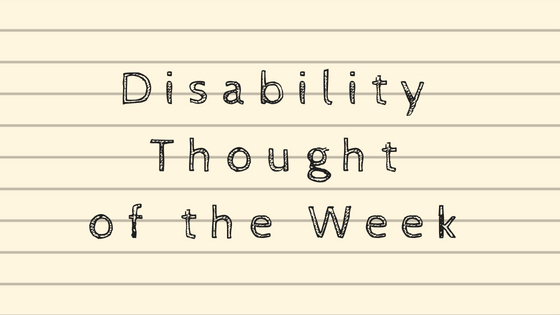 Many disabled people either won't frequent a business that isn't accessible, or will go out of their way to give their business to places that are. That, in a way, is the flip side of viewing accessibility as a praiseworthy "extra." Some people think of accessibility as something added to selected spaces to benefit a specific disabled person, like an automatic door or wheelchair lift added to a school because there’s a student in a wheelchair there. This confuses “accessibility” … which is universal and ready when … and “accommodation” … which is by definition individual and only installed to meet someone's specific need. Some people see accessibility as nothing but an arbitrary, annoying, expensive regulation, to be followed as quickly and painlessly as possible, or else ignored in the hope that nobody will complain until it’s too late to be able to do much to fix it. Most often, people talk about accessibility as if it's an unusual pet peeve ... a real issue, but one that affects a small, quirky subset of the population, not a broad-based concern. Of course, some people … particularly disability rights activists … consider lack of accessibility to be nothing less than discrimination. By not making a public space accessible, you are discriminating against whole categories of disabled people, whether you intend to exclude them or not. There also seems to be two fundamentally different concepts of time in regard to accessibility. Some people still think of accessibility as a new thing, a new set of requirements that it’s going to take time to adjust to. Meanwhile, for disabled people especially, accessibility is a problem that’s been dragging on for decades. In fact, many of us find it baffling that anyone can still be unaware that accessibility is no longer an nice option, but has long been a legal requirement. The first federal accessibility standards were developed in 1968. Accessibility was included in the Rehabilitation Act of 1974 to apply to federal facilities. The Americans with Disabilities Act applied accessibility standards to businesses and local government facilities in 1990. We have all had decades learn about accessibility standards and comply with them. Finally, some people consider accessibility to be an extremely hard thing to achieve. Yet, compared to so many other social equality goals, accessibility is incredibly easy, since it simply means following a detailed but clear and unambiguous set of construction guidelines. You don’t have to know anything about disability. You don’t have to have your “awareness” of disability “raised” one bit. You don’t have to feel comfortable around disabled people. You just need to make sure the space you are in charge of meets the standard. And if you don’t know exactly how to do it in your situation, you can ask for help, which is often free or available at very low cost. Materials and labor cost money, of course, but even then, it’s a definable, predictable, stable target to shoot for, and has been for decades. None of these thoughts are at all original or revolutionary. I just think it’s helpful once in awhile to review them and ask why we are all still dealing with this problem like we just started working on it last week.